The phones that were allegedly found in possession of a prison officer at the Mazaruni Prison. A Prison Officer has been arrested and handed over to police after he was allegedly found in possession of a large quantity of marijuana and several cellular phones at the maximum security prison at Mazaruni. The Guyana Police Force said the 27-year old man was arrested Wednesday morning at about 9 O’clock at the bachelors’ quarters. 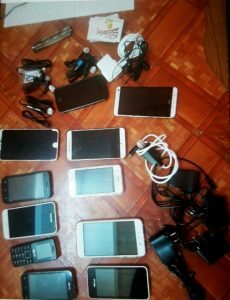 There, he allegedly had in his possession nine new cellular phones with chargers, 403 grammes of marijuana, one SIM and one memory card in a haversack on his bed. In the past, Guyana Prison Service personnel have been caught attempting to smuggle marijuana and other prohibited items into the country’s jails. The prison service has repeatedly cautioned against committing such acts as they can endanger the safety and lives of prison service personnel and inmates. 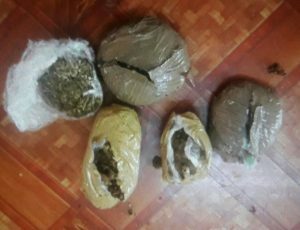 The marijuana that Guyana Prison Service personnel said was found in possession of a prison officer at the Mazaruni Prison. burning to death of 17 prisoners last year and the destruction by fire of the Georgetown Prison earlier this year. More than 20 prisoners had escaped from Georgetown and Lusignan Prisons, but most have since been recaptured alive and are again behind bars.